When you need high-quality outdoor lighting for your Hudson Oaks home, Creative Nightscapes is here to help. Our team of experts designs and installs landscape, security, patio, poolside, and garden lighting to enhance the appearance of your home or to create a safer outdoor environment at night. Whether you want to highlight specific features on your house or draw attention to certain trees or other landscape features, we can come up with the right lighting plan for your property. We look forward to creating an outdoor lighting design that works best for you based on your property layout, your design preferences, and other factors. Our team at Creative Nightscapes in Hudson Oaks has the expertise needed to provide exceptional outdoor lighting design and installation. We work closely with customers to ensure that we create the ideal outdoor lighting plan to enhance their property and fit their needs. Once we have come up with the perfect plan, our team handles the installation process from start to finish. We use high-quality materials and work as quickly and efficiently as possible. Homeowners in Hudson Oaks can count on us to get the job done to their satisfaction. At Creative Nightscapes, we know how important it is to have lighting contractors that you can trust. We do not use any subcontractors for our services; our design and installation teams are both key parts of our company. We also maintain the lighting systems we install to help ensure that you have beautiful outdoor lighting that lasts for many years. That’s part of our dedication to making sure that each customer in Hudson Oaks receives only the best service from us. 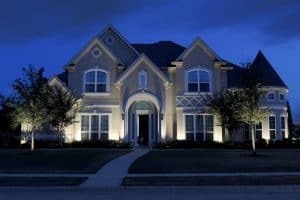 Creative Nightscapes has been providing quality outdoor lighting services to homeowners in DFW for over a decade, and we’ve handled over 4,300 lighting projects in that time. Owner Patrick Cheatham has a passion for creating the right landscape lighting design for homeowners and a dedication to ensuring that each customer in Hudson Oaks receives the best service. Helping those in need is also important to our company. Creative Nightscapes proudly supports Sower of Seeds Ministries, which is a non-profit organization that helps children around the world gain access to food, water, education, and housing. 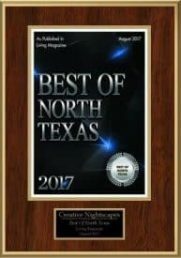 Creative Nightscapes has received an A rating from the Better Business Bureau. As part of our commitment to providing outstanding service, we are also a member of the Association of Outdoor Lighting Professionals. Our company has been awarded Angie’s List’s Super Service Award on several occasions, and we have been named Contractor of the Year three times in a row from national lighting organizations. Average home prices in Hudson Oaks are around $247,500, making it more expensive to buy a home here compared to the Texas average of $142,700 and the national average of $184,700. These higher prices are due to the fact that residents here enjoy an average household income of $104,435, which is much higher than the national average of $55,322 and the state average of $54,727. The city provides residents with easy access to major cities in the area. Dallas is about an hour away via I-30E, while Fort Worth is just 30 minutes away via I-20E and I-30E. Those who live in Hudson Oaks can easily get to either city for work or leisure. Hudson Oaks is a small city with less than 2,000 people. Within the city itself, there are a few places to visit for shopping and dining. Enjoy Cajun dishes, including Cajun caviar, popcorn crawfish and crab cakes at Boo-Rays of New Orleans, located on North Lakeshore Drive. To satisfy a sweet tooth, visit Ultimate Cupcake on Fort Worth Highway for freshly-baked, gourmet cupcakes, which are available in a variety of flavors. Hudson Oaks residents who want to be an active part of the community can look into joining local boards and commissions, such as the Planning and Zoning Commission. If you’re ready to get outdoor lighting installed on your Hudson Oaks property, contact Creative Nightscapes. We’ll help you design a lighting plan that beautifies your home and install it right away. To set up a consultation, call us at (817) 581-6936. We love the lighting! It's exactly what we were looking for. Installed LED accent lighting to highlight façade. 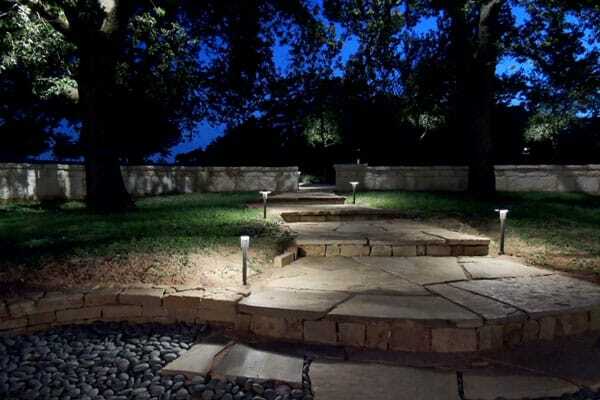 Path lighting to illuminate the walkway and landscape greenery. Driveway marker lights to mark the sides of the driveway entrance and exit. Moonlighting in back yard seating area.